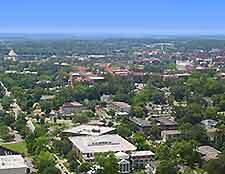 Tallahassee, has been the capital of Florida (FL) since 1824 and is a charming provincial city. With mature oak trees often lining the streets, Tallahassee is located on the northern tip of Florida. Tallahassee is home to the famous state legislature and Tallahassee also contains the spreading campus of Florida State University (FSU), housing more than 25,000 students, as well as Tallahassee's popular Florida Agricultural and Mechanical University (FAU). 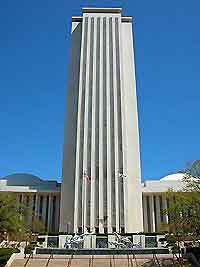 The city of Tallahassee offers a range of sights worthy of a visit, including Tallahassee's monumental New Capitol building, which towers 322 feet / 98 meters and offers an observation deck. Tallahassee is a relaxed, slow-paced city, which features an interesting mixture of old and new. 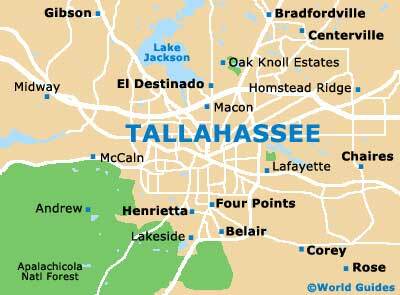 Tourism is a significant part of life in Tallahassee and this charming city welcomes visitors. The main tourist information outlet in Tallahassee is the Visitors Bureau on East Jefferson Street. Here you will find a host of helpful tourism and reservations advice, together with leaflets about Tallahassee's main tourist attractions and sights. Accommodation in Tallahassee is widespread and there are no distinct variations in hotel rates throughout the year. Hotels in Tallahassee are located in three main areas, the downtown district, on North Monroe Street and along Apalachee Parkway. Further hotels can be found nearby Tallahassee Regional Airport (TLH), which is just a short distance from the city. More information about Tallahassee Hotels. Tallahassee features an assortment of popular tourist attractions, including Alfred B. Maclay State Gardens - home to beautifully landscaped gardens, incorporating an impressive house, natural trails and a large lake, popular for fishing and boating; Mission San Luis - one of Tallahassee's most popular and historic tourist attractions, with ancient architecture, many important artifacts and regular guided tours; and the Goodwood Plantation, Gardens and Museum - featuring landscaped gardens and antebellum houses with many period features and antiques. 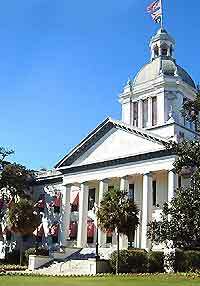 More information about Tallahassee Tourist Attractions. Some of the best museums and art galleries in Tallahassee include Mary Brogan Museum of Art and Science - particularly popular with families, promoting science, technology and art, with many temporary exhibits and activities; the Tallahassee Antique Car Museum - housing an impressive collection of vintage cars, important historic vehicles and original Batmobiles from the famous Batman television series; and the Tallahassee Tallahassee Museum - containing a zoo with natural habitats, a science center, hands-on information and scenic nature trails. More information about Tallahassee Museums and Art Galleries.